As I write this, NASA's New Horizons probe is just a few minutes away from its closest approach to Pluto at 7:49:57 EST, though pictures taken at that time will take several hours to reach Earth. Already the probe has provided a steady stream of increasingly detailed images of that tiny world which, until now, we knew only as a blurry reddish dot. About three billion miles away (the distance varies due to the eccentricity of its orbit), Pluto is about thirteen thousand times more distant from us than the Moon is. It has taken the probe nine and a half years to get there from Earth. 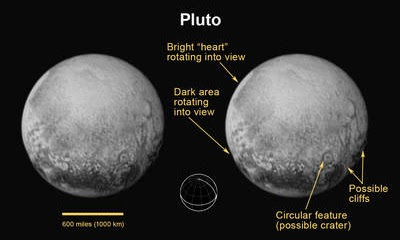 Looking at Pluto's surface features, we're seeing things which (as far as we know) no eye has ever seen before. The mission page is here; new pictures and information are being posted as they come in. A truly amazing mission--but it also made me go back and re-read Clifford Simak's 1974 story "Construction Shack" in which the first probe to Pluto uncovers a mystery that is front and center of the first manned mission to Pluto. Needless to say, the answers found by the astronauts are mind-blowing. Very exciting! We're looking forward to all the photos! This is exciting stuff! I vaguely remember when the New Horizons mission was launched; I recall it being during a heatwave in my neck of the woods, and thinking, "Hmm. A frigid world like Pluto seems like it'd be a nice place to be right now - wish I could've hitched a ride!" Seriously, though, this is incredible: the fact that a probe has finally been sent to one of the most remote bodies in the Solar System - one so far away that any pictures taken of it before now were likely as not nothing more than indistinct blobs, or tiny points of light in the sky. I can't wait to see what other images get sent back! This is so exciting! We're seeing photos from a mysterious new world. It looks like the pictures will take a while to come in yet -- but the probe has "phoned home" so we know it's OK and the data will be transmitted. Zosimus: Being in the middle of the northern hemisphere summer, I feel somewhat the same way about a cold place -- but I wouldn't go to Pluto to enjoy the cold until NASA has confirmed the existence of tea there.